Rejuvenate Your Smile – A Brighter, Healthier Smile Starts with a Fresh Approach to Orthodontic Care. Fresh Orthodontics is a state-of-the art Orthodontic Clinic in the Park Slope neighborhood in Brooklyn, NY. Dr. Ankush Khanna, the clinic’s founder, draws on his extensive clinical and teaching experiences to provide personalized orthodontic care in a warm and kid-friendly environment. Fresh Orthodontics has been designed to offer orthodontic treatment using the latest technologies such as ultra-low-dose radiation x-rays for kids, and Acceledent to speed up Orthodontic treatment by up to 50%. Offering a wide variety of orthodontic treatment including traditional metal braces, tooth-colored braces, Invisalign, lingual and WildSmiles Braces, Fresh Orthodontics is Brooklyn's most patient-centered orthodontic clinic, providing care for kids, teens, and adults in a fun and relaxed atmosphere. Each time you visit Fresh Orthodontics, we are committed to WOW you with the experience. Our knowledgeable and friendly staff aims to exceed every expectation and allay any fears or concerns you may have about your orthodontic treatment and the experience of getting braces. Fresh Orthodontics is all about open and honest communication. Dr. Khanna will discover your goals and needs and present you with the treatment options tailored specifically for you. Ask anything and everything. You’ll learn about the pros and cons of each option so you can make an informed decision you feel great about. We’re excited to meet you and help you achieve a beautiful, healthy smile. Some of our patients are referred to our Brooklyn clinic by their general dentist, however, a referral is not required. Simply contact us and set up a FREE consultation with Dr. Khanna to assess your orthodontic needs. We know New Yorker’s have busy lives juggling work, family, school and Netflix binges, which is why our professional and friendly team is dedicated to keeping wait times to a minimum. Additionally we offer a variety of scheduling options to accommodate early risers, night owls and weekend warriors. How’s that for service! Most children likely won’t need braces right away, and often Dr. Khanna orders an observational period after the first visit. Dr. Khanna will simply monitor your little one’s dental and facial development and let you know when it’s time for orthodontic treatment. Whether a teenager needs traditional metal braces, Invisalign or merely a retainer (lucky), Fresh Orthodontics will be by your side every step of the way from the initial consultation to the final visit. In today’s image conscious world, adults tend to be great candidates for esthetic options like Invisalign and clear or lingual braces, meaning the fact you’re undergoing orthodontic treatment will barely be noticeable. Nerd alert, Dr. Khanna got accepted into dental school as a senior in high-school! After completing his residency at New York University, he worked in various practices in Manhattan and Brooklyn until launching his clinic, Fresh Orthodontics! Dr. Khanna currently holds a teaching position in the dental residency program at New York Methodist hospital, and because he loves to share his passion for orthodontics, he also sits on the Board of Trustees for the Brooklyn Second District Dental Society. Dr. Khanna believes in creating strong relationships with patients, their families and the community as a whole. He is dedicated to a patient-centric approach based on high-quality customer service and exceptional results. Fresh Orthodontics is a state-of-the art orthodontic clinic in the Park Slope neighborhood of Brooklyn, headed by Dr. Ankush Khanna who draws on his extensive clinical and teaching experiences to provide personalized orthodontic care. 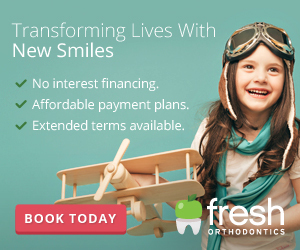 Fresh Orthodontics has been designed from the ground up, offering orthodontic treatment using the latest technologies such as ultra-low-dose radiation x-rays for kids, and Acceledent to speed up orthodontic treatment by up to 30-percent. We offer complimentary exams, are in-network with many insurance providers, do not require referrals, and provide evening and weekend appointments.